Metadata in Word documents can reveal information that the creator of the document had no intention to distribute. This ranges from information about the author to comments and a unique identifying ID. It can lead to all kind of privacy leaks. Microsoft even recommends to distribute documents in paper form only on their website. 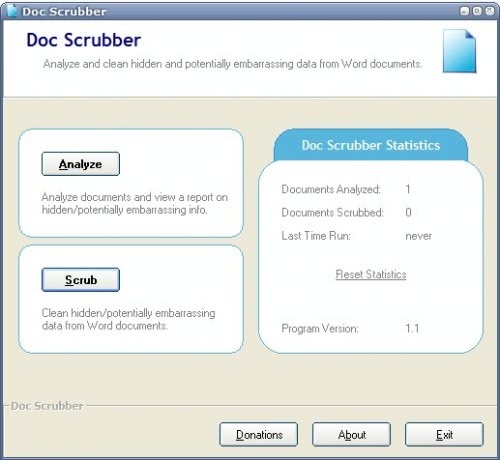 Doc Scrubber is a Microsoft Word metadata scrubber which can be used to analyze and scrub Word documents. The software program is compatible with Windows 98, ME, NT, 2000 or Windows XP. It has been designed with simplicity in mind. It basically is managed by the two buttons Analyze and Scrub. Analyze lets the user analyze one specific Word document to see if and which information it reveals in the metadata. The Scrub button is where the real action takes place. It can be used to scrub a single document, all Word documents in a folder or selected documents of folder. By default a new document will be created after the scrubbing with the metadata removed which is another option that can be changed in the program's settings. The user is given the choice to remove only the metadata that he selects. A total of 13 different settings can be removed from the selected Word documents including subject, keywords, comments and several dates including creation and last saved data. Three of those 13 options can reset data back to their default values. This includes setting the template back to normal.dot, the revision count to 1 and the total editing time to 0. The very same menu contains two options to replace the author and company to values specified by the user. If the BTK killer had this he wouldn’t have been caught!